Nose- Slight peat, of course, but as expected, a light affair. Complexity abounds. Lemon peel, fresh herbs, meadow grass. Un-ripened peaches and nutmeg. Sweet pipe tobacco, citrus rind. Good marriage of light smoke, floral touches and sweetness. Lovely and clean. Taste- Soft vanilla and smoke with sweet spice. Lemon cake with powdered sugar. Melon. Great taste. Finish- Medium length. Sweet/sour lemon candy. Nutmeg. Ends phenolic with tobacco. Comments- Well integrated, excellently composed and presented. 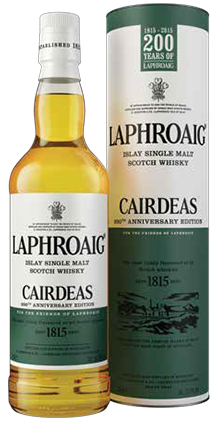 Refined and complex with just enough Lahproaig house style to satisfy. Agreed, may want to push this one to a 90/100. I think this one evolves a little over time. I still have have the bottle, I’m always open to another look. When my bronchitis is over, I will reexamine.